The Laurent-Perrier garden has long been a fixture at the Chelsea Flower Show and this years collaboration with designer Ulf Nordjell was one of my show favourites, snapping up a well deserved gold for their contemporary take on a romantic garden which married both English and French styles. So when I heard that The Dorchester Hotel was celebrating the 100th RHS Chelsea Flower Show with a special Laurent-Perrier Floral Afternoon Tea, I was on the telephone quicker than you can say "53 Park Lane" booking my table to join in the fun. 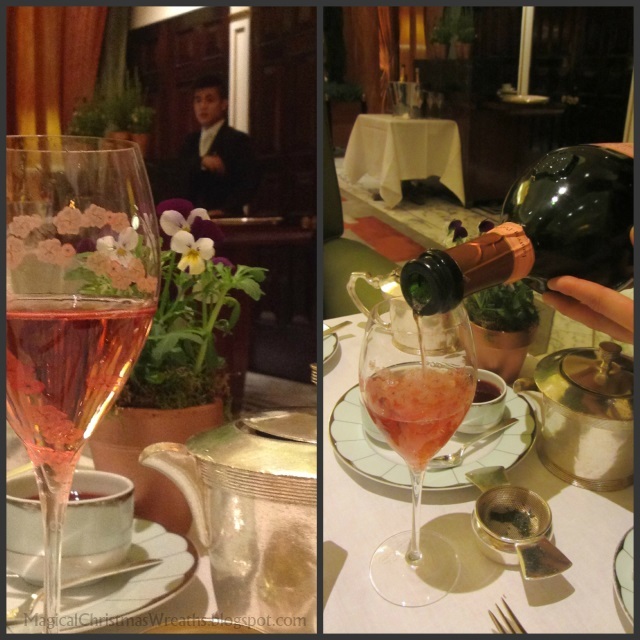 To coincide with the event, The Dorchester Hotel's executive Chef, Henry Brosi designed a collection of floral-inspired cakes and pastries for little old me to enjoy alongside my favourite rose champagne. How could I resist? To begin with, the most deliciously refreshing Passion fruit pannacotta chocolate cup to cleanse the palate. I'm swooning already! I opted for my favourite Arabian Mint Garden tea, I think Hercules chose the Puttabong Queen 1st Flush Darjeeling Tea in the end but I can't be sure, I was far too busy politely filling my face with cake you see. OK, perhaps just one more....on behalf of the RHS of course! A perfectly relaxed ambiance. The flower filled promenade was beautifully scented by Roja Dove Laurent-Perrier candles accompanied by a mellow pianist playing in the background. Fresh scones were served alongside a 'Candied Lemon', a lemon-shaped sponge cake filled with lemon crémeux and a white chocolate flocage; 'Violet’s Garden', a red berry & violet mousse on a crunchy short bread with crystallized violets; and ‘Lavender basket’, a dark chocolate tartlet infused with lavender with a spun sugar handle. All served with that unmistakable, Dorchester elegance! SIR PAUL! Is that you in the last shot, drinking to your heart's delight? WHAT A FUN PLACE! My dream is to have a real tea party in such a place, in LONDON, of course! Thank you for sharing your romps out and about the most glorious city to have tea, see fine shops and just have a fabulous time. It is breakfast time here in Toronto and I'm reading your delicious post with all these scrumptious delicacies which made me more hungry. WOW! I will try them all! The Hotel is so elegant and the event so fun! Attending the Chelsea Flower Show must have a been a fun day ending with this first class tea at the Dorchester. A day well spent. Bon weekend! What a stylish (and sweet) way to celebrate Chelsea! Well aren't you the handsome one? I do love how we Brits sneakily named getting sozzled in daylight hours as "Afternoon Tea." OMG, simply splendid, Sir Paul. Good afternnoon, "Bon Viveur!" What can I say? You know how to live! I must say... I would have been very at ease in those surroundings and would have enjoyed meeting people and pretending I was a plant expert!Anything to get my hands on that Italian classic "Pannacotta" (Passion fruit flavoured! My favourite! I love passion fruit! )and to have a good time! All the food looks absolutely fantastic!Though I don't have a sweet tooth, as they say, I am tempted by beauty, and that food looks so wonderful! The ambiance is incredibly decadent... wow! i could eat the lampshades and look at the big plant arrangements, sitting proudly and beautifully inside the fantastic antique looking pots. I love ferns, so reminiscent of times past. Well... looks like you had a good time, posh man! Off to Italy, tomorrow. Will be posting from there (a new town house! )and, as soon as I sort out my phone, you'll see my pics on Instagram! Looks fabulous Paul! Almost too beautiful to eat. Thank you for your kind comment on my recent post. Have a fab weekend......! Paul,your post looks so ivited....!!! HOW delish must be all these recipes and I know almost for sure,you got lovely experience there! Have a great one, Mister P! You and Hercules definitely lead 5 star lives especially to a little country bumpkin like me. 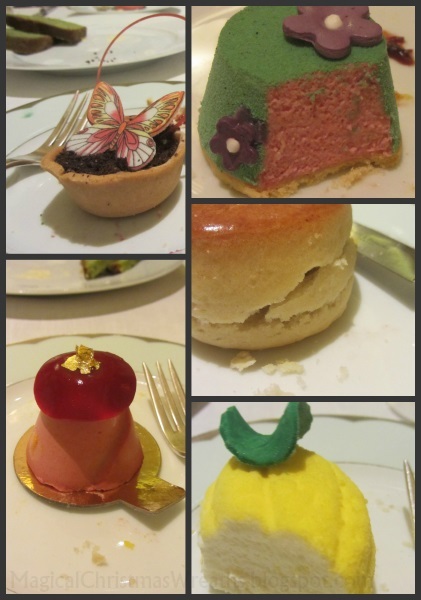 It all looks totally out of this world - absolutely beautiful, loved seeing those decadent cakes - cheers Paul. Now I say that is living Paul and Hercules. Every morsal and drop looks delicious and each better than the next. An afternoon to remember. lovely pix. now i am hungry all of a sudden. Paul this looks like the perfect way to spend an afternoon! I am afraid I would not be much for conversation with all of the delectable treats! One is more beautiful than the next. I hope you have a spectacular weekend, filled with friends, sunshine and fun. When I go to London, and I will once my boss gives in to my relentless whining of how I need to straighten out the UK office, you will take me here! Did they roll the two of you out of there because after all that I can't imagine how you were able to rise out of your chairs. As a cake aficionado, may I say that I turned the slightest shade of emerald as I read this post. 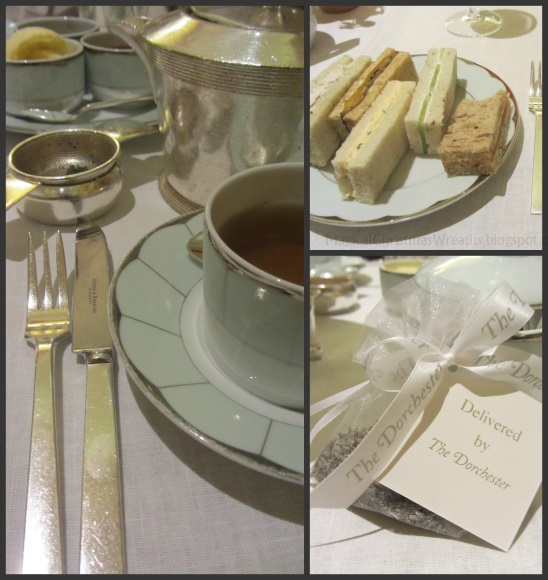 The Chelsea flower show and The Dorchester...such a good combination :-) Your 'floral' menu looks special. The ambiance alone is like a dream. How I love places like this, with so much history, delicious food and lots of interesting people to look at. You look very classy and perfectly dressed for the occasion. I see you even wear a flower ;-)? Sir PAUL! Still taking your tea, I see! Thank you for wandering over the pond to my home and garden to see what my husband and I do to entertain our minds! It is a humble home but now has taken on more character as we add our imaginations and may I add our BACK strength to making the gardens into something visually appealing...on a BUDGET! I am back to blogging for now; my poetry class doesn't start for another 3 weeks, but even so, I do continue to follow you all and your exploits! Paul, Don't know how I missed this fun post. You and Hercules sure know how to live!! What fabulous cakes and sweets. There is nothing that even comes close to this in the states. They really went all out with the creations here. The English really know how to make life lovely. I'd be in heaven with the tea, champagne and taking it all in. 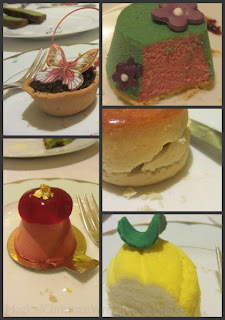 The Dorchester is now on my list for a tea stop...You look so dapper and I am loving your dandy flower on your lapel! What can you say...Life is sweet!! !